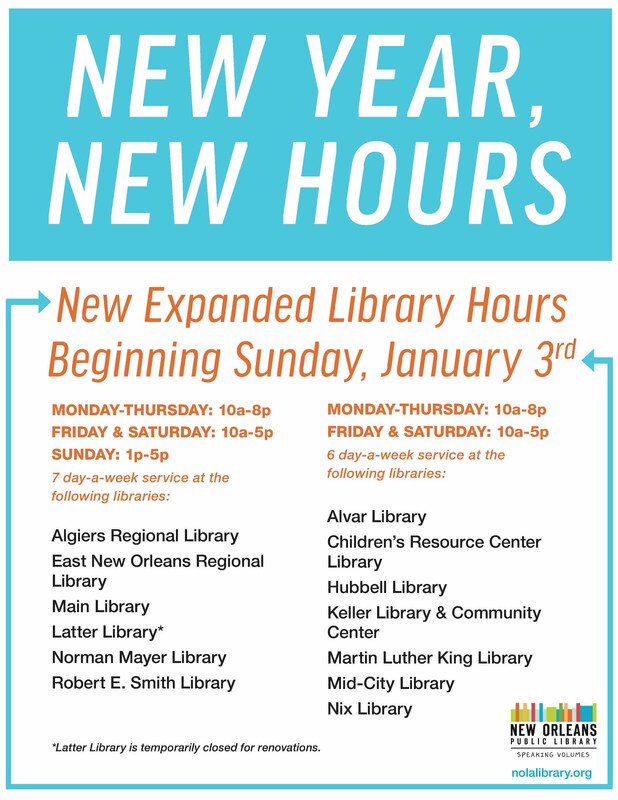 As a result of the library millage increase approved in 2015, extended hours for New Orleans Public Libraries will begin on January 3, 2015. The schedule for all libraries is shown below. The Algiers Regional Library will be open 7 days a week - M-Th: 10a-8p, Fri & Sat: 10a-5p, Sun: 1-5p. The Hubbell Library will be open 6 days a week- M-Th: 10a-8p, Fri & Sat: 10a-5p. Thursday, January 7, 6:30 pm - 8:00 pm. The address is 725 Pelican Ave, New Orleans, LA 70114.